On the Doorbuster deals. Limited quantities. Use code DB13SAVE150 to get this price. Need to go to dell / deals / cyber Monday doorbuster. Sorry, not easy to post great on my phone. Decent price for an 8th gen, high spec 2-in1. Really good deal only let down is the storage. Eh? Seems standard for SSD especially at this price. You must be confusing it with a a normal drive. Heat added, excellent find compared to what's out there for Cyber Monday. Reviews aren't too great though, sadly. Not sure what reviews you've read, but ones I read were largely positive. I bought this same model a few weeks back after doing a lot of research and waiting for a deal I was happy with. The backlit (yay) keyboard is a bit light to the touch and took a little getting used to but other than that I am very happy with it. It feels like a quality product physically. When looking at reviews you have to make sure it's the exact same model and spec, not one from a few years back. I read a fair bit about the screen being poor and ghosting - so I nipped in to PC World a couple of times before buying from Dell to check it out and compare. I saw no such problems and in fact the screen on the 13" Inspiron was superior to similarly priced Lenovos and ASUS models (which I was also looking at). There is also a HUGE difference between the 13" and 15" Inspirons. The 13" are very sturdy with a good screen (default setting is a bit dull for my liking, but that's what brightness controls are for). The 15" are plasticy with a very poor screen. This tends to go for a lot of this mid-priced 13/15" models - All the Lenovos, HPs, ASUS etc I looked at - the 13" models were sturdier and better built. I suggest anyone (for any laptop brand they're interested in) to see for themselves and not rely solely on reviews. I would've gone for a Lenovo if I'd done that, and after seeing them they went straight off my shortlist. Not sure what reviews you've read, but ones I read were largely positive.I …Not sure what reviews you've read, but ones I read were largely positive.I bought this same model a few weeks back after doing a lot of research and waiting for a deal I was happy with. The backlit (yay) keyboard is a bit light to the touch and took a little getting used to but other than that I am very happy with it. It feels like a quality product physically.When looking at reviews you have to make sure it's the exact same model and spec, not one from a few years back. I read a fair bit about the screen being poor and ghosting - so I nipped in to PC World a couple of times before buying from Dell to check it out and compare. 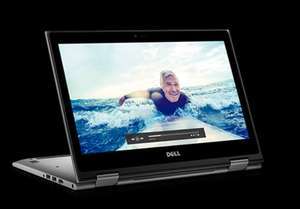 I saw no such problems and in fact the screen on the 13" Inspiron was superior to similarly priced Lenovos and ASUS models (which I was also looking at). There is also a HUGE difference between the 13" and 15" Inspirons. The 13" are very sturdy with a good screen (default setting is a bit dull for my liking, but that's what brightness controls are for). The 15" are plasticy with a very poor screen. This tends to go for a lot of this mid-priced 13/15" models - All the Lenovos, HPs, ASUS etc I looked at - the 13" models were sturdier and better built.I suggest anyone (for any laptop brand they're interested in) to see for themselves and not rely solely on reviews. I would've gone for a Lenovo if I'd done that, and after seeing them they went straight off my shortlist. You’re not wrong - that’s a great review...glad I bought it now. But all gone so gonna expire it. Thanks for taking the time to give an unbiased review. Is this available anywhere else for a similar price?